Free web sites: These are primarily for evaluation purposes, enabling a free playground for anyone who wishes to experience Azure Web Sites at no cost. Free web sites have no SLA. Shared web sites: These reduce some of the restrictive quotas associated with Free, allowing you to run your web sites 24x7. However, shared web sites are still very much limited in capacity and feature set. Shared site have no SLA either. Basic web sites: These are designed for production of small to medium web sites. Basic web sites have all Azure Web Sites core abilities at a reduced priced. Standard web sites: These are designed to be used in production for medium to very large web sites. Standard web sites leverage the full range of Azure Web Sites capabilities, enabling advance scenarios such as high-availability and improved development operations (DevOps). A quick note about Shared pricing tier: When using Shared web sites, you are being charged per site and per instances. A Shared site costs less than a Basic site, but both the Basic and Standard pricing tier offer a dedicated Virtual Machines, on which you can run as many web sites as the Virtual Machine can handle (mostly constrained by memory), and all the same price. For example if you have 5 Shared web sites (sites or instances), you might as well move the 5 sites to Basic pricing tier, as the overall cost of running 5 Shares sites is similar to running one small Basic Virtual Machine. How to change my web sites pricing tier? With the April release of Microsoft Azure, changing a web site pricing tier has changed a bit. To change a web site pricing tier, you’ll need to change its associated Web Hosting Plan (WHP). Web hosting plans are a new concept for Azure Web Sites and represents a set of features and capacity that you can share across your web sites. 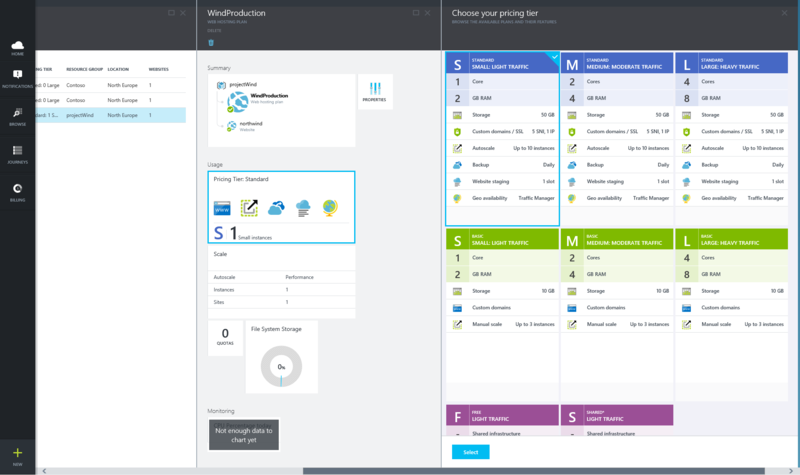 Web hosting plans support the 4 Azure Web Sites pricing tiers (Free, Shared, Basic, and Standard) where each tier has its own capabilities and capacity. Sites in the same subscription, resource group, and geographic location can share a web hosting plan. All the sites sharing a web hosting plan can leverage all the capabilities and features defined by the web hosting plan tier. All web sites associated with a given web hosting plan run on the resources defined by the web hosting plan. For additional details about Azure Web Sites Web Hosting Plan, visit this article. Using the Full Azure Portal, you can change a web site’s pricing tier using the SCALE tab as shown in the following image. This is similar to the existing web site scale experience. 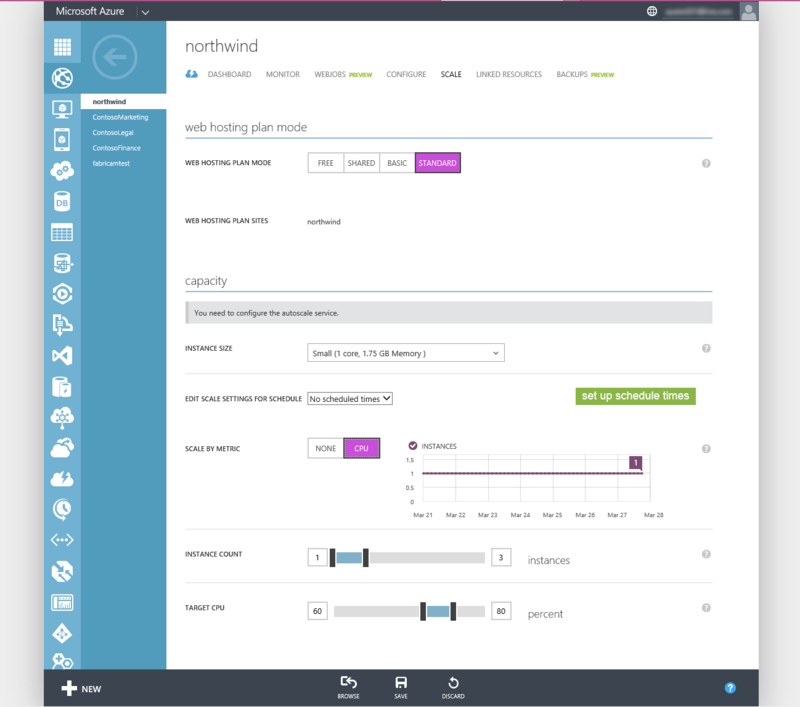 One difference between the previous scale experiences to the new on is that all sites associated with a Web Hosting Plan will change their mode at once: Using the Preview Azure Portal, you can chose the pricing tier of your web hosting plan. In the image below you can see the Web Hosting Plan blade as well as the Pricing Tier blade. Clicking on the Pricing Tier part in the Web Hosting Plan blade expands the Pricing Tier blade where you can change the pricing tier for the web hosting plan: Summary The new pricing tier is a great benefit to many customers, offering some high-end features at a reasonable cost. We hope this new offering will enable a better deployment for all of you.